These Dates Cake have become our family favorite from more than a year now, my kids who are not a big fan of dates finishes this cake in no time and they don't even know its dates cake. Because of its color and the very soft and moist texture it has a glimpse of chocolate cake but the taste resembles a bit of our Kerala Fruit Cake with its cinnamon flavor and melt in mouth moist bites. So do you believe you can bake a very moist cake without butter, eggs or even milk?? Of course for sure, I've already posted a recipe of Chocolate Chip cupcakes before and since then I believe anyone can bake eggless and butterless cakes. But the complete credit of this dates recipe goes to Lakshmi Nair's show Magic Oven where she narrates the making of this cake so well. I even I love the fact that majority of the work is done stove top before you proceed with adding the dry ingredients. You can as well prepare the dates mix ahead of a day, leave them overnight to cool and use it the next day and bake the cake. 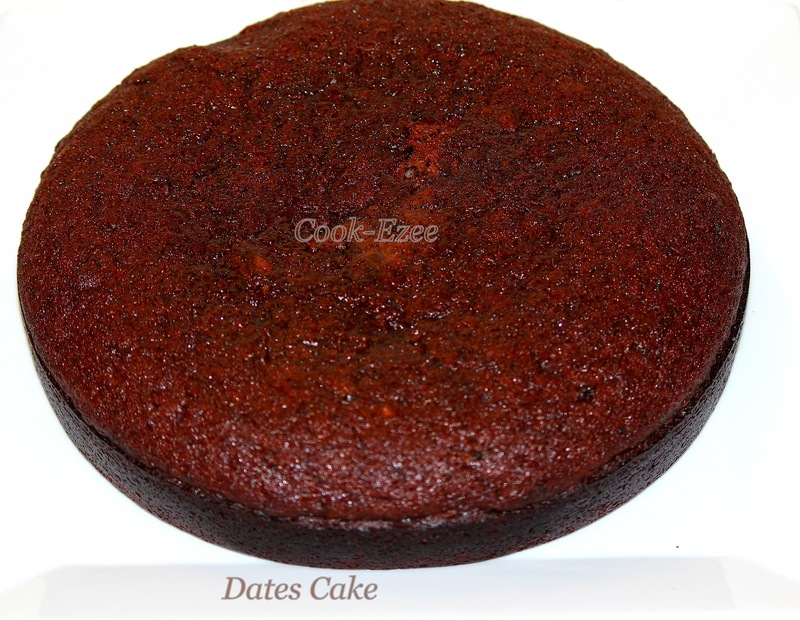 So try out this very simple and ezee to bake super moist dates cake at home and Enjoy!!!!!! Pre-heat the oven to 350 Defree F. Grease and flour the baking pan and set aside. Sieve twice together - flour, baking powder, salt and set aside. Add chopped dates, spice powder, sugar, vegetable oil and water in a pan or kadai, stir and mix well. Heat up the pan and bring the dates mix to boil by stirring them occasionally. Simmer to medium heat and let it boil for seven to ten minutes, stir in between so that dates do not stick to the bottom of the pan. Switch off the stove and let it cool completely. Make sure the mix is not even a tiny bit hot. Now add the flour little by little to the dates mix, stir well with a whisk or wooden spatula making sure no lumps are formed. Pour this mix to prepared cake pan and bake for 40-45 minutes or till a cake tester inserted comes out clean. Take out from the oven, let it cool completely, slice and Enjoy!!!!!!!! wow....the dates cake look super duper yummy dear...very tempting !!!! Cake came out super prefect,super soft and fabulous. I love sticky toffee pudding, and your date cake reminds me of that pudding..albeit healthier! This is bookmarked for our next tray bake weekend treat! That sounds really ezee and yummy..thanks for your comments on my space and following...i am ur new follower now.